There are other worlds than these… and we’re gonna dominate the hell out of ‘em. 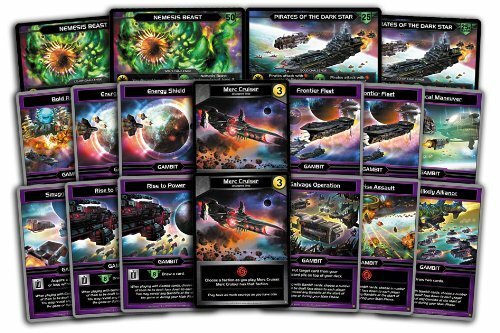 Star Realms, a two-player deck-builder (that can expand to six players with an extra deck), is all about forging a mighty alliance and then weakening your opponent’s authority in the galaxy until their empire crumbles. And yes, it’s as fun as it sounds. Star Realms isn’t a revolution. It follows many standards for deck-building. You begin with a handful of basic cards that either offer one credit or do one damage to your opponent. A shared marketplace (the Trade Row) sits at the center of the table and you’ll need to spend the cards you’ve drawn each turn to purchase cards and attack the person across the table from you. Where it starts to separate itself is in the speed at which you can build a formidable deck (games are usually under 30 minutes) and the variety offered by the factions. There are four factions you’ll need to contend with as you attempt to prove your space superiority: Trade Federation, Blobs, Star Empire, and Machine Cult. Choosing factions carefully is one key to having a powerful deck. Most cards give a bonus if another card of the same faction is also in play. That might mean a few extra coin to spend, drawing extra cards, or dealing some serious damage to your nemesis. You might also want to consider buying some outposts – semi-permanent bases that can insulate you from attacks – though most offer minimal financial or offensive firepower. Of course, most of your choices are governed by the marketplace and what becomes available… and what your opponent hasn’t bought from under your nose on her turn. 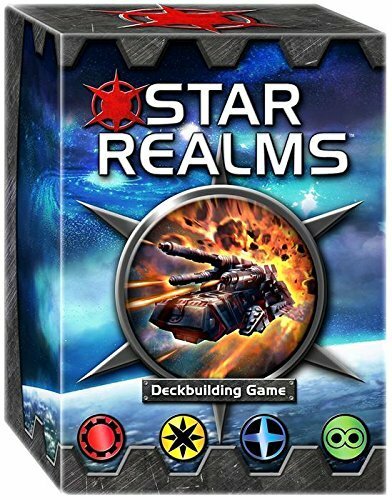 But that’s Star Realms, a fast-paced deck-builder that has dominated my game table for the past eight months. 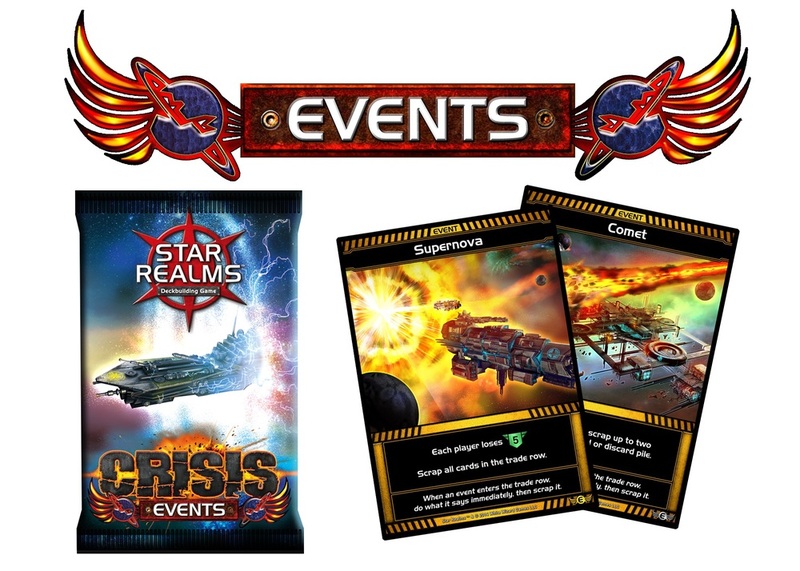 Star Realms is a vision of the future... a future with lots of lens flare. I have an affinity for deck-builders. I'm a big fan of the Machine Cult. Play all of your cards, combining all credits earned into one pool, all damage into another. Buy cards from the marketplace, placing new cards in your discard pile. Fill any vacant spots in the marketplace. Outposts must be destroyed before any other damage can hit opponent. First player to drop the other to zero Authority (health) wins. Ascension, Dominion, or any standard deck-building game with a communal marketplace. You combo cards that allow you to draw more cards, that in turn combo to draw more cards, and lead to the utter obliteration of your opponent with a massive attack. I bought an okay card with my last credits only to have the next card revealed to the marketplace be something incredibly useful… that my opponent could buy. t’s a deck of cards and nothing more. The art is great and the design makes it easy to understand the important values on each card. It uses cards to count health instead of including tokens or a die as a health counter. Star Realms has well-designed cards. One game is enough to know the basics, but it can take a while to really grasp how to create an efficient deck regardless of what’s available in the marketplace. Not well. You have to be able to adapt quickly… and it’s hard enough doing the math to reduce your health when it’s cards and not tokens. Doing so drunk would be a disaster. There are quite a lot of expansions now available for Star Realms and, like the core game, it’s all reasonably priced. The oldest and most mixed is the Star Realms Gambit Set, which contains 20 cards. While the 13 Gambit cards are just okay, there are also a set of missions that can be played solo or cooperatively. Co-op Star Realms is quite an interesting experience and really changes how you view and play the game. 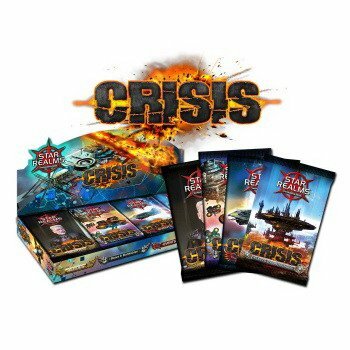 The Crisis Packs: Four recently released Crisis Packs offer different ways to enhance your Star Realms experience. Some are better than others. All are pretty cheap. And, really, if you enjoy Star Realms, getting a bundle of the four is the best way to go. Each booster comes with 12 cards. If you were going to skip one of the boosters, this would be it. The Star Realms Heroes booster add faction characters whom, when acquired from the Trade Row, immediately play on your board. Each Hero is basically a sacrificial lamb. Their abilities only activate when scrapped (removed from the game) and, of the most part, the abilities are fairly weak stuff. Yes, they can help when used strategically, but the heroes are a bit underwhelming. Probably my favorite of the boosters, Event cards add a new element of unpredictability to Star Realms. When an Event is revealed in the Trade Row, it immediately goes into play. Most of these are bad things for all players (such as a Black Hole – yipes!) that will do damage, but can be mitigated by discarding cards or the like. It’s fun to have these little traps floating around, because it gives a sense of a largely galaxy that you’re playing within. As the name suggests, the Bases & Battleships booster adds new moderately potent bases for each faction as well as some heavy-powered ships. If you feel like you’ve seen it all from having played Star Realms a bunch of times, these will liven things up. The flip side of the Bases & Battleships, the Fleets & Fortresses booster comes with powerful new bases for each faction along with a handful of new ships. A blast to build up big combos. Each faction feels very distinct with its own advantages and disadvantages. The faction you prefer may be in limited supply in the marketplace. Tend to do nibbles of damage at each other, then suddenly someone can strike for immense damage in one turn and pretty much crush you. The health cards should be tossed and replaced with dice or counters. Star Realms has amazing art. WOULD I BE WILLING TO SUCCUMB TO THE MACHINE CULT IN ORDER TO KEEP PLAYING STAR REALMS? You need a great two-player game. You don’t want to spend more than 20 bucks.